After a summer of vacations, camps, and relaxation, back-to-school season is upon us. Even ten years ago, back-to-school shopping meant browsing newspaper flyers for the best deals on dorm necessities, clothing, and school supplies. While total back-to-school spending is expected to reach $74.9 billion this year, purchasers are no longer waiting for Sunday’s newspaper to find the best deals for tackling that back-to-school list. 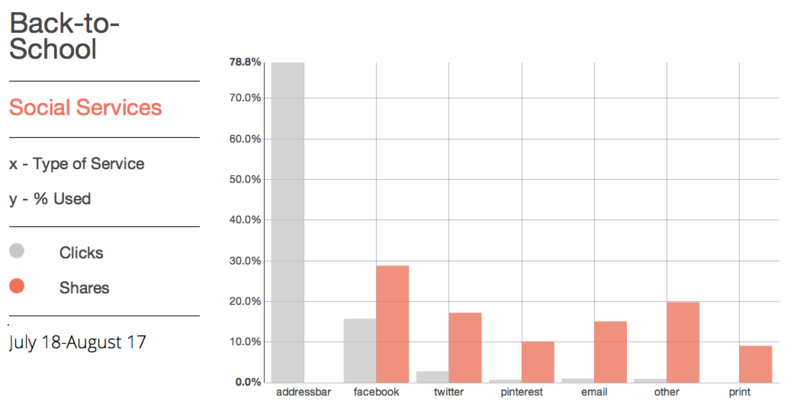 We looked at our data collected across over 14M sites in the last 30 days. We found how consumers are shopping this year, so you can engage your back-to-school audience. It’s old news that mobile usage is quickly growing and catching up to desktop usage, but we found that back-to-school shoppers are even more likely than average to use mobile devices. Mobile usage made up 55% of engagement with back-to-school content, while desktop usage contributed to 45% of engagement. 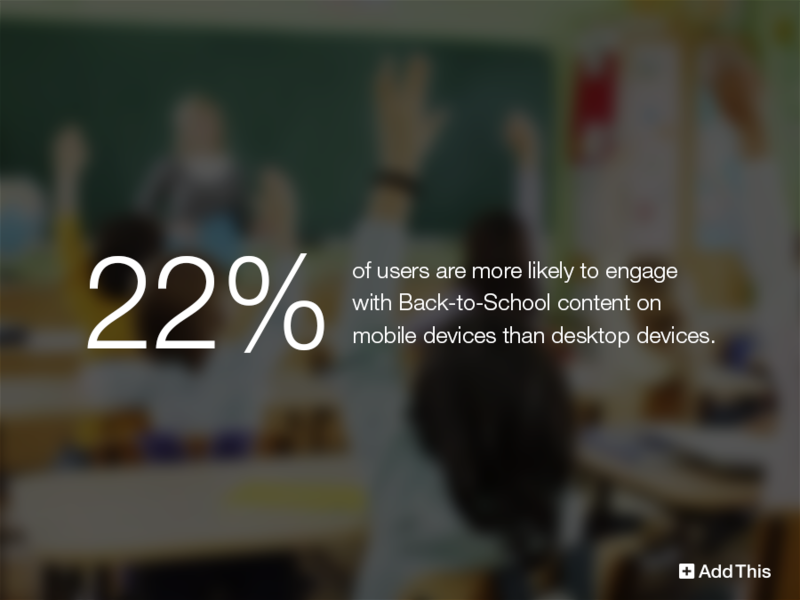 In fact, users were 22% more likely to engage with back-to-school content on mobile devices than on desktop devices! As far as mobile devices go, iOS devices are the preferred product for back-to-school shoppers. Engagement from iOS devices is nearly 2X more likely than from Android devices. Even though kids and college students are the ones beginning classes, they most likely are not purchasing their own supplies. Parents are the ones spending the majority of the money, so it’s important to know how they are engaging online. While Facebook and Twitter are still popular for sharing back-to-school content, private sharing methods like e-mail and print are being used frequently by parents. Moms are getting inspiration from Pinterest for school lunches and clothing trends as well! Another thing parents love? A good deal! Top shared back-to-school content involves giveaways and sale items. In addition to deals, make sure it is known if you sell goods across multiple categories like electronics and clothing. Parents look to make shopping as painless as possible by minimizing shopping destinations and looking for one-stop shops. We saw back-to-school content engagement begin in mid-July, but engagement has steadily increased into mid-August. Engagement with back-to-school content during the second week of August was 75% stronger than the first week of August. Weekday engagement with back-to-school content has been strong, with clicks and shares falling off during the weekends. Parents may be researching during the week, then purchasing items with kids in tow on the weekends. Most parents wait until one to three weeks before school begins to start shopping, and some parents do the shopping once school is in session. Keep the social media posts, email campaigns, and deal advertisements coming until September! It isn’t too late to engage your back-to-school audience! Be sure your site is mobile-friendly, advertise sale items, keep posting on social media, and take a look at your AddThis Dashboard to see your most successful back-to-school content.